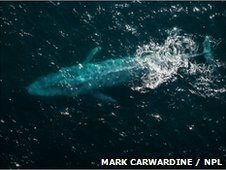 A blue whale's mouth cavity is so vast and stretchy that it can engulf a volume of water equivalent to its own body mass, say scientists. 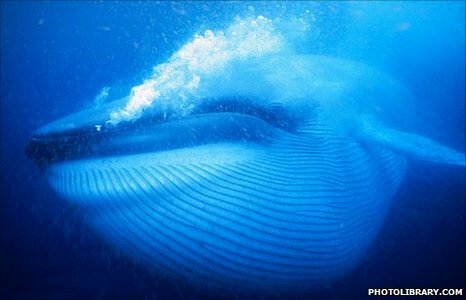 The whales - the largest animals on the planet - filter the krill they eat from these huge watery mouthfuls. Researchers based in the US and Canada studied the giant mammals to find out how much energy they needed to fuel their lunging feeding dives. They report their findings in the Journal of Experimental Biology. Jeremy Goldbogen from University of California San Diego led the study. He and his colleagues combined direct measurements from sensors on the whales' bodies, and physics-based models, to calculate the mass that each mammal took in as it moved through the water. They go from being a streamlined missile with their mouths closed, to ballooning right up - it's incredible. Robert Shadwick, a zoologist from the University of British Columbia who was part of the team studying the whales, told BBC News: "When you see the animals in the feeding ground, they take a breath and go under. "But they're not under water for very long considering how big they are - it's something of a paradox." The average dive time was just 11 minutes and the team was puzzled as to why the whales would not stay underwater for longer. Longer dives would maximise the amount of food they consumed and possibly offset the great energy cost of each dive. The researchers discovered that the blue whale's mouthful was so huge that, in these relatively short dives, they could consume up to 100 times the amount of energy they used in a dive. The sensors the scientists attached to the whales showed that, at a depth of about 200m, they turned upward and opened their mouths. The animals then quickly lost speed as they inflated and took on the weight of large volumes of water. "They go from being a streamlined missile with their mouths closed, to just ballooning right up," said Dr Shadwick. "It's incredible." This ability is thanks to the whales' very unusual anatomy. A blue whale has pleats of skin and blubber below its mouth that extend to its belly, forming a stretchy, cavernous extension of its mouth. "It's equivalent to if you could shove your hand into your mouth and under the skin right down to your belly button," explained Dr Shadwick. "A sort of pouch under the skin, which balloons out enormously - almost into a spherical bubble." This means that a 90 tonne blue whale could take in 90 tonnes of water. It then filters out tiny marine creatures through a special comb-like structure in its mouth called baleen. 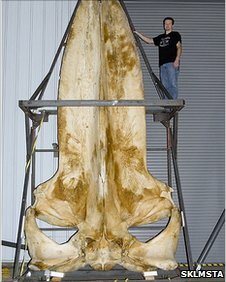 The fully open mouth would be big enough for another blue whale to swim into, said Dr Shadwick. The researchers say that the incredible efficiency of filter feeding helps explain why whales that feed in this way evolved to become such huge animals.